My husband loves the seasonal Cranberry Bliss Bars from Starbucks, so I thought I would try to make something similar for him at home. Most of the recipes I looked at used dried cranberries and orange extract, neither of which I love in my baked goods, so I baked a batch using fresh cranberries and the zest of a couple of clementine mandarins. I also have a thing for nuts in my baked goods, so I had to throw in some macadamia nuts too! Line a 9 x 13 baking sheet with parchment paper or prepare with butter. With a mixer fitted with paddle attachment, beat the butter and sugar, then add eggs, vanilla extract, clementine zest and mix. Add the flour, salt, baking powder, and ginger and mix until just fully incorporated. Stir in the white chocolate chips, cranberries, and macadamia nuts. Spread the mixture evenly on the prepared cookie sheet. Bake for 20 - 25 minutes until middle of cake has set. Do not over bake. While bars cool, prepare frosting by combining all the ingredients in a bowl and beat using an electric mixer until frosting is a spreadable consistency (about 3 minutes). 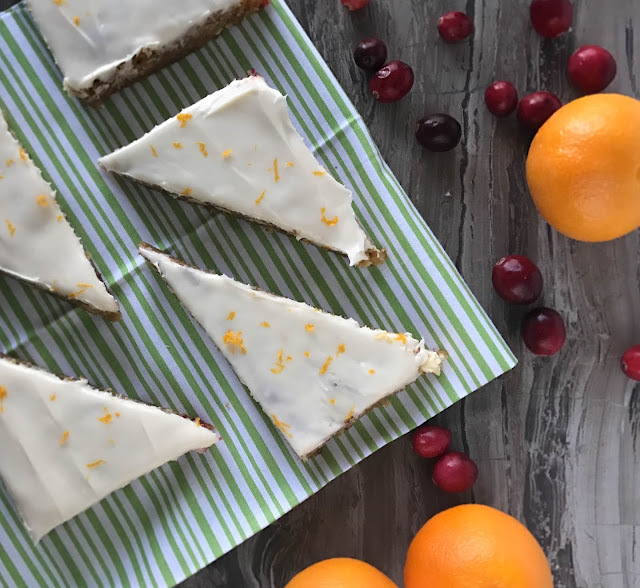 Once the bars have cooled, frost with cream cheese frosting and garnish with zest of an clementine or the topping of your choice. You can drizzle melted white chocolate, top with chopped dried cranberries, sprinkle with chopped macadamia nuts, or all of the above.